One of our important client ‘segments’ is the Natural Resource Management (NRM) industry, and we thought we’d introduce them to our wider audience, as well as what we do in partnership with them. The NRM “industry” in Australia is really more like a community. Depending on where you are in Australia, your local NRM groups will be not-for-profit companies, government agencies, community groups and all sorts of different permutations of that. Across all these different types of corporate vehicles, you meet some really passionate and interesting people from a wide range of backgrounds – conservation, farming, business, retirees, the works. They are really what keeps the whole NRM industry running. The crowd at the recent Rangelands NRM AGM – a broad range of people attended from a really diverse set of backgrounds. 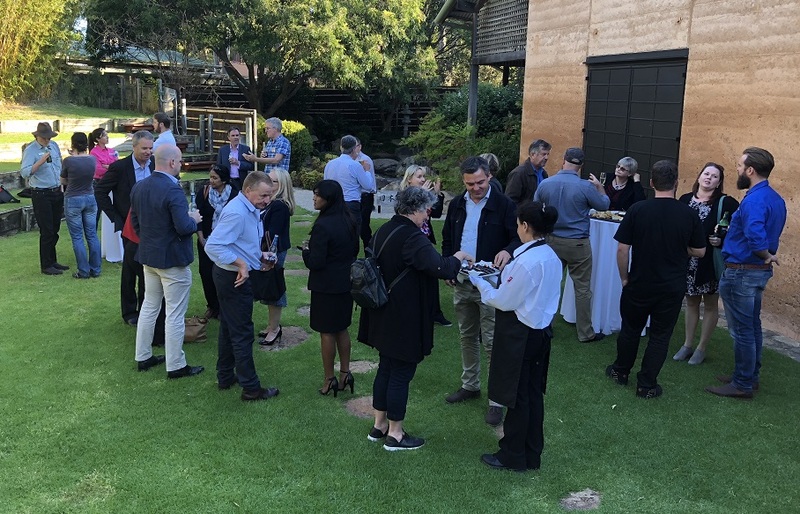 When we first met the NRM community, their work reminded me of the community we were part of when I was growing up on a small farm in the south-west of Western Australia. A lot of passionate people, a lot of volunteers, all getting together to make their corner of the world just a little it better, in a bunch of different ways. That includes things like helping advise on sustainable agricultural practices, fence off areas to protect them against feral animals, undertake weeding (like our Perth office team did before Christmas), running educational events, and all sorts of other things. Through these sorts of actions they manage, improve and protect the natural resources, and are a voice for the environment. What we also saw was a need to help out with the technology side of things. Our first, and probably the biggest, project with the NRM community was GRID. Originally this was seen as a way to create a new corporate spatial system for the South West Catchments Council, one that was easy to use and tailored for the various activities that the NRM group undertook. Keen to make sure the project delivered, we invested a lot of additional time and effort into the development of GRID on top of the funding we received through State NRM, including a second round to tweak GRID further. We have been fortunate enough to be able to provide GRID to the NRM groups across Western Australia. We’ve developed a way to do this that starts with a small project to establish GRID with the groups, customising it and setting up the various activities that they need. Then for the ongoing costs, we also roll in monthly data updates of all their data, an annual training course wherever they wanted in their region (plus an administrator session), and unlimited phone and email support for their staff, and any of their community groups that use it. Making any generic product that has to suit a wide range of people means you’re not going to make everyone happy, and we take every bit of feedback about GRID very seriously. We’ve been developing wish lists, capturing any and all feedback, and looking at the future of GRID and how we can look at making it even better in the next version – and how we fund it. That’s the area that we’re actively looking at right now – pulling all the requirements together to start costing what it would take for the next version, and how we make this all stack up – not easy for a small business! Along the way with GRID we’ve also delivered a lot of other projects in the NRM area, including web sites, spatial support and mapping, development of online shops, and we’ve even been involved in the grants process itself, through last year’s GRID Grants implementation (a lighter, simpler front end to GRID for the grants process that creates a baseline spatial area for the grants). Spatial sciences has been a bit part of our history at Gaia Resources – we did, after all, start as a spatial company. 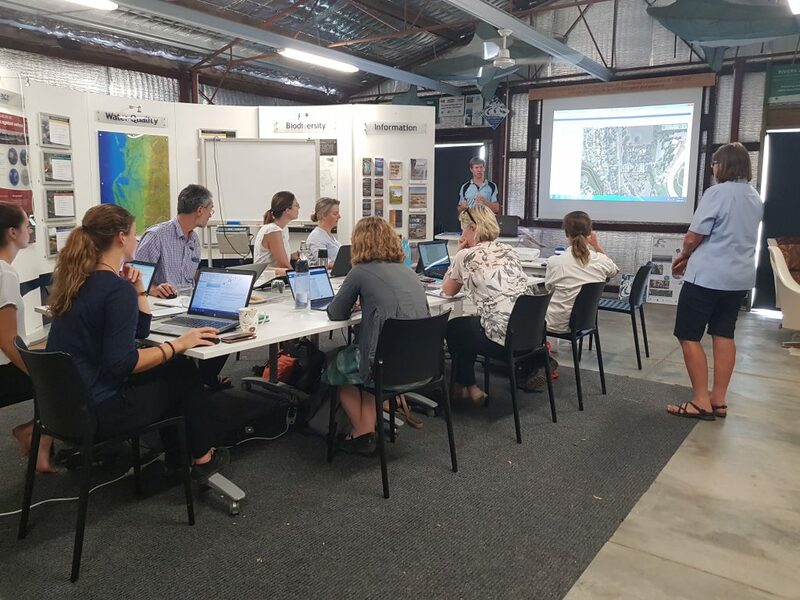 And when the South Coast NRM group, through Project Dieback, asked if we could help them with QGIS (a freely available, open source GIS package) training, we jumped at the chance, and created our freely available online QGIS training course. Again, we invested heavily in this, and developed a course that has been taken up all over the world. 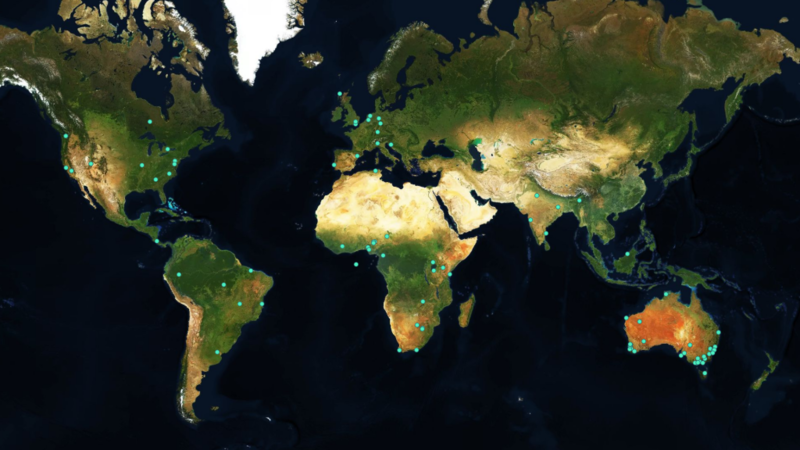 Our current map of the people who’ve asked for our training manual and data for the freely available online course. The NRM community has been working hard, especially over the last year or so, at creating sustainable business models. Meanwhile we’ve been looking at the same sort of business models and how we can make our technology offerings even more appropriate and sustainable. We’re already working on an updated QGIS training course, pulling together GRID 2.0 requirements (which you can find in our Wish List) and even offering shared spatial services across the groups. The best part of working with the NRM community is the people. Frank, fearless and passionate, there’s no shortage of people telling us how we can improve and make things even better for them. We’d love to hear from any NRM groups with ideas or requests for assistance – you can reach out via email, Facebook, Twitter or LinkedIn. While the NRM community continues to look after the natural resources of the world, we’ll keep on supporting them for as long as they’ll let us. I hope that’s for a while to come yet.